We have a great bunch of kids on the Glenwood Knights Chess Team. Not only did they play well at Galena, they showed outstanding sportsmanship, also. Seven members of the chess team traveled to Galena, MO (leaving at 5:30 a.m.) to play a tough 6 round tournament Saturday, February 2, 2019. The Knights did fantastic!!! The placements were as follows: Lauren Shipley – 2nd place, Morgan Lee – 3rd place, Toby Keith – 5th place, Kyler Curran – 6th place, Tucker Keith – 7th place, Kaden Curran – 12th place and Nehemiah Wright – 17th place. It is not surprising that with all of the individual placements, Glenwood took the First Place team trophy for the K – 8 division. 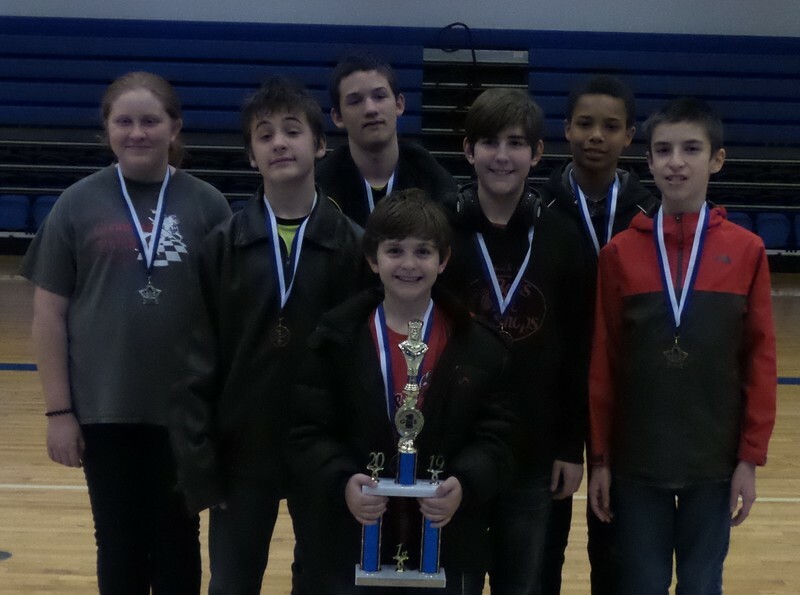 Please congratulate the Glenwood Knights Chess Team on a Job Well Done !!! Pictured Above: Front row: Tucker Keith; 2nd row: Lauren Shipley, Kyler Curran, Toby Keith, and Morgan Lee; Back row: Kaden Curran and Nehemiah Wright.